Schumann: Märchenerzählungen Op. 132, I.
Schumann: Märchenerzählungen Op. 132, II. Schumann: Märchenerzählungen Op. 132, III. Schumann: Märchenerzählungen Op. 132, IV. Longtime friends bound by their Israeli roots and summers shared in Vermont at the Marlboro Music Festival, and now trio members for a decade, Alon (piano), Amit (cello) and Alex (clarinet) perform recitals that reflect their special gifts and originality as soloists as well as their marvelous sense of ensemble and love of chamber music. 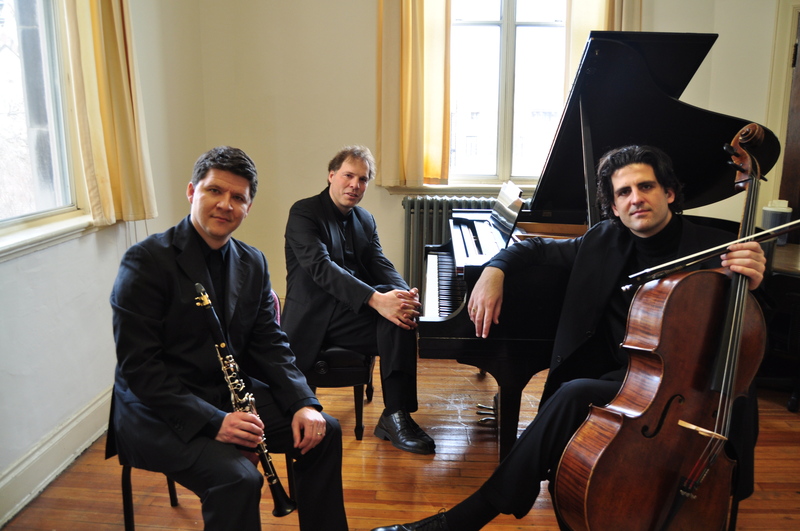 Wonderfully varied programs include such works as the Beethoven and Brahms Clarinet Trios, sonatas and solo works that demonstrate both the artists' virtuosity and their infectious musicality. If desired, brief program notes from the stage engage the audience in the total concert experience. Alon Goldstein, pianist, is admired for his musical intelligence and dynamic personality. Mr. Goldstein’s artistic vision and innovative programming have made him a favorite with audiences and critics alike throughout the United States, Europe, South America and Israel. Amit Peled, a musician of profound artistry and charismatic stage presence, is acclaimed as one of the most exciting cellists on the concert stage today. Mr. Peled, described by the American Record Guide as “having the flair of the young Rostropovich,” has performed as a soloist with many orchestras and in the world’s major concert halls. Alexander Fiterstein, clarinetist, is recognized for playing that combines flawless technique and consummate musicianship with graceful phrasing and a warm, soulful tone. A recipient of the 2009 Avery Fisher Career Grant Award, Mr. Fiterstein is a first-prize winner of the Carl Nielsen International Clarinet Competition and the Young Concert Artists International Auditions.